The AMD 780G chipset got us excited about integrated graphics platforms again after its release last March. You can imagine our surprise when AMD contacted us in April asking what we would like to see in the next IG chipset scheduled for release this year. Of course, we obliged AMD with our wish list that included everything from 8-channel LPCM audio over HDMI to HD 3650 or higher-level performance. We also requested a new Southbridge with improved RAID performance along with RAID 5 capability. More importantly, we wanted a chipset that could run true CrossFire and bridge the gap between the budget IGP and enthusiast level markets. In other words, we wanted a chipset that could serve the multimedia and small form factor audience in a uATX form factor or provide top-flight performance and features for the enthusiast in an ATX form factor. You know, something like the NVIDIA 750a SLI product or Intel’s P45 only with an IG unit. AMD listened intently and replied they had something that might just fit our requirements. We were even more surprised to learn that it was arriving in late June under the 790GX moniker. Yes, we had to wait until early August but estimated release schedules in this industry have a tendency to be overly optimistic. For those diehard AMD fans, the delay in the release of the 790GX has been frustrating. Mainly due to the fact that rumors swirling around the internet about the performance and capabilities of the 790GX have been a bit more optimistic than the release schedule. Unfortunately, speaking of release schedules, we think later August would have been a better target after spending the last week testing our 790GX products. In fact, we ran across so many problems that our article today is a preview of the chipset capabilities. We will follow-up quickly (Editor- no more food or Guitar Hero until this is finished) with a full review of products from Gigabyte, ASUS, Biostar, and Foxconn. The majority of our problems center on BIOS tuning and driver related maladies. After speaking extensively with the motherboard suppliers, we are certain the BIOS releases that arrived late last night or those coming today will address problems ranging from NB multipliers/HT Ref Clock change requests not accepted via BIOS or AOD to 8GB compatibility issues along with other minor performance hindrances like memory SPD settings not being read correctly when overclocking. PCI peripheral support with a couple of network and audio cards is also giving us trouble. Of course, BIOS tuning can take you only so far and the requirement for solid drivers is necessary. The 8.521.1 driver set, aka Catalyst 8.8 beta, has significant performance optimizations for the 790GX plus full support for the new C1E power savings mode, PowerPlay, and deep sleep instructions for the SidePort memory, umm Performance cache. As is the case with beta drivers there are liable to be various features that might not work correctly. One important feature that failed to work properly for us was CrossFire operation with our HD 4850 or HD 4870 cards. Other problems ranged from proper C1E implementations and S1/S3 resume issues to HDMI repeater/screen resolution setups with commercial BD playback software. AMD informed us late today that we should roll back to the 8.7 drivers for testing all items but C1E. Of course, this meant graphics, power management, and performance testing on our test platforms just got tossed out the window. It also meant a reduction in IG performance around 3%~5% and some quirky results with C1E and Cool-n-Quiet enabled. On a side note, we still do not have the latest version of AOD working correctly with any of our 790GX and 9950BE combinations after a stellar appearance on the 790FX board we utilized in our SB750 preview. Actually, these problems are typical during the launch of a product. It just seemed that in our case the perfect storm brewed as it was nearly impossible to close out each benchmark session without running into a problem. We sailed through discreet graphic card testing with the beta drivers but were stymied with the inability to run CrossFire although Hybrid CrossFire worked fine. Our power draw tests revealed three different sets of numbers, not an explainable difference due to a board’s components, but a 30W difference at idle with the same components and BIOS settings. RAID 5 testing resulted in several different sets of IOMeter results between the boards that we are still investigating. Problems even carried over to HDMI output through our receivers although it appears rolling back to the 8.7 drivers today cured those issues. In our estimation, the BIOS and drivers needed some additional brewing time before the product release. While it may seem we are picking on AMD, this occurs with NVIDIA and Intel also. In fact, we could devote an entire page to our early experiences with G45. However, all this said, we did find the motherboards to be extremely stable in the normal course of testing with major applications that typical users will utilize. In addition, performance from the integrated graphics unit is simply superb considering AMD’s competition. We did not discover any show stopping problems that would prevent us from purchasing the product at this time. Just beware that a BIOS spin and updated driver release will be required to get the most out of the board’s additional features. So let’s take a look at the chipset specifications of the 790GX chipset. "Curiously enough, AMD cited "competitive concerns" as a reason why it would not disclose exactly what's going on with this new overclocking feature. We still cannot help but wonder if it is because AMD is going a little too far in the sacrifices, it is willing to make in the quest for higher clock speeds." "reason could be that AMD found something nice"
Agree. And this same statement was uttered when ACC appeared in the SB750 review. One thing which wasn't clear to me was: "vertex and texture caches are fully associative instead of separate." "Fully associative" has a meaning when it comes to caches, yet I imagine that's not what it's about. Sounds from the sentence like the caches have been unified (as opposed to separate). Too bad AMD has no clue in other areas! Sheesh! You really hate Microsoft don't you? It seems the 'new' Advanced Clock Calibration is based on something that already existed in SB700 but was undocumented. 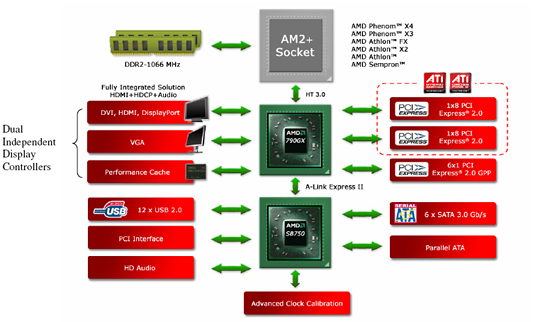 Based on the speculation, ACC could be the clock skew feature used by some other motherboards. That aside, RAID5 is a definite welcome addition, but unless it includes XOR offload, it really isn't much of an improvement. BTW, it is inexcusable for not having Ethernet support these days. The claim of adding 2 specific 1.1 ports for compatibility reasons is confusing. USB 2.0 ports are 1.1 already compatible, just using slower speeds. HyperFlash is a poorly implemented idea, especially when production Flash SSDs already exceed the maximum bandwidth of HyperFlash modules anyway. It is better off to just wait for Flash SSDs to mature. And which manufacturer's 780G mobo would run with a Phenom 9950BE ? Is that possible?